Tripp Lite, a world-leading manufacturer of power protection and connectivity solutions, has expanded its KVM line with the introduction of two Dual Monitor DVI KVM Switches. The B004-2DUA2-K and B004-2DUA4-K allow users to control computers with dual-head DVI video cards, giving them the ability to use two monitors. For computers with three- or four-head DVI video cards, the KVMs’ Quad-View Mode provides support for additional monitors by connecting two switches together. With support for Dual Linkresolutions up to 2560 x 1600 and analog resolutions up to 2048 x 1536, 2.1 stereo sound and a 2-port USB hub, these top-of-the-line KVMs offer the flexibility needed to easily manage any system. "We're excited to introduce our new Dual Monitor DVI KVM Switches," said David Posner, Tripp Lite Product Manager. "With the ability to control multiple video cards, they are the ideal solution for CAD/CAM and graphic designers; medical, educational and financial institutions; and high-end gaming." For more information on the new KVM Switches, visit: Tripp Lite Dual Monitor DVI KVM Switches. 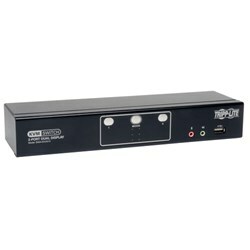 To download product images, go to: DVI KVM image download. Outstanding product reliability and exceptional service have been Tripp Lite trademarks for over 90 years. Tripp Lite’s innovations include the world’s first UPS system designed specifically for personal computers, and the world’s most trusted premium surge suppressor--the Isobar®-with more than 19 million in use. Tripp Lite maintains the highest level of ready-to-ship inventory in the industry with more than 2,500 different products, including UPS systems, rack systems and cooling solutions, PDUs, PowerAlert software for enterprise-level system management and control, surge suppressors, KVM switches, cables and connectivity products, inverters, power strips and notebook accessories. Headquartered in Chicago, Illinois, Tripp Lite maintains a global presence with fully staffed offices worldwide. Additional information, including a list of Tripp Lite’s sales offices and authorized reseller partners, can be found by visiting Tripp Lite’s website: http://www.tripplite.com. Online Retailer 123inkcartridges.ca is always striving to meet the needs of their customers by constantly expanding their inventory of products. The company recently announced the availability of high-speed HDMI cables with Ethernet. The product specifications of these cables are: 3-D ready, Ethernet, full HD/1080p Resolution, high speed up to 10.2 Gbps, Ethernet capable, high-definition audio, deep color and x.v.Color, audio return channel, 4K resolution 3840 x 2160. Online printer supplier, 123inkcartridges.ca just announced that it is expanding its product line in an attempt to meet customers growing printer needs. Among the latest additions is the Brother tn-450 New Compatible Black Toner Cartridge. This particular printer accessory is a high yield cartridge that will allow many more prints for the money. This can be a sound economic decision for the business which does a lot of copying or printing on a daily basis as the new cartridge allows for up to 3 times the previous amounts of prints to be made. The Brother tn-450 ink cartridge is covered by a one year guarantee to ensure that their customers are satisfied with this high quality product. This latest announcement from 123inkcartridges.ca comes as no surprise as the business continues to expand their product lines to meet customer demands. They carry many other printer products including many that are compatible with the brand name of Brother. These high quality cartridges are available for consumers to order from the online store. The cartridge has a shelf life of up to 2 full years and is not refurbished; it is a brand new item. The printer company has a full line of printer and computer related products which can be viewed at their site online at: http://www.123inkcartridges.ca. Consumers will find that the online supply company has a wide variety of printer and computer accessories which can easily be ordered online and shipped to their business or home address. The company provides 24 hour customer service representatives which are available to assist them in finding a product and completing their orders. They can also answer questions should they arise. 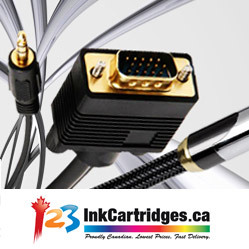 123inkcartridges is located in Canada and is one of the fastest growing online suppliers of printer and computer related products. They currently have more than 10,000 products in their catalogue which is constantly expanding to include new products. They also have more than one huge warehouse where they house their high quality products so that they can expedite shipping to their customers. 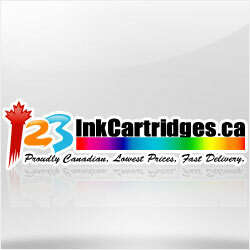 Their full line of products can be viewed online at http://www.123inkcartridges.ca. Another benefit is that shipping is free for orders totaling more than $ 49. In an attempt to keep up with the public demand, the Canadian based online resource 123inkcartridges.ca just released their updated product list which includes the Google Android TV Dongle. The online printer and computer related products store is continually adding newly released products. This latest addition is on the cutting edge of the latest technological advancements. Consumers will find that the products offered by 123inkcartridges.ca are of high quality in performance and features. The addition of the Android Intelligent system Wireless Expansion is just one example of how the Canadian based company is keeping up with the latest high tech products that consumers are looking to purchase. This latest product addition by 123inkcartridges.ca demonstrates the companys determination to grow the company in order to meet the needs of consumers. The Android product contains a built-in WiFi that allows the user to watch television or videos from their computer without having to switch back and forth across channels. The company is placing these types of devices on their product list as soon as they are available to the general public to try and keep up with customers wants and needs. The Google Android TV Dongle is just one of the many products that 123inkcartridges.ca offers to consumers through their online store. They are constantly expanding their product line to include the latest useful gadgets. 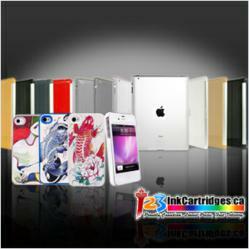 Their full line of products may be viewed and ordered from the official site at: http://www.123inkcartridges.ca/. 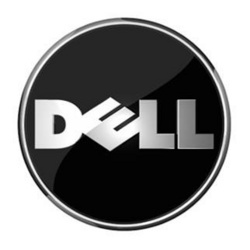 By perusing the site, consumers can see that the company offers a broad range of computer and printer related products that are necessary for the home or the office. This online company is based in Canada and serves a broad customer base across Northern America. They began with a line of printer inks and toner cartridges. Because of their high quality products and reasonable prices they soon grew to be the number one online resource for printer related products. Soon, they added a line of products related to computers as well. More recently they have made further expansions which include smart phone accessories. 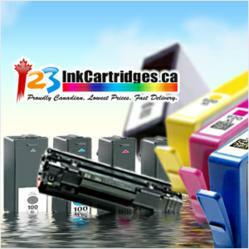 Their product line can be viewed at: http://www.123inkcartridges.ca/. They are a growing company who continue to offer consumers only high quality products at affordable prices. Shadow Technology announced today that they had added a new "Backup & Restore" feature to their popular IP Call Recording Software "Call-Shadow". The Backup feature adds advanced call archiving and data retention to "Call-Shadow". Enterprises can now implement their goal of storing communication recordings for 5 years, using standard storage technology. Recordings can be archived to DVDs, BluRay discs and SANs in just a few clicks. A single DVD-R can store up to 15,000 calls of 5 minutes each, due to the state of the art voice compression technology implemented in "Call-Shadow". "This development is the result of customer demand", said Alex Kafkarides, Director of Marketing at Shadow, and the cost is still only $ 300 per monitored phone". "Shadow Technology will continue its aggressive development schedule in our aim to become the leading supplier of VOIP Call Recording". " We are already commited to SIP protocol support and call authentication and integrity checking for our next release, 3.2, which will be available in Q2." He ended. The latest release of "Call-Shadow" is available for download from http://www.shadow-technology.co.uk and can be used for 30 days. Call-Shadow is highly integrated with Cisco CallManager, having an XML phone service which allows replaying calls directly on the phone, and being integrated with CallManager's user directory (LDAP DCDirectory) for unified authentication. Mission Critical Reliability - peer to peer clustering system with no single point of failure. Should a server failure occur, its peers in the cluster will automatically detect it and share the workload. Calls in progress are recorded from where it left. Audit Replays - prevent recordings abuse by browsing the list of accesses to a call. XML Phone Service - handily review your past calls from your XML enabled phone (Cisco IP Phones 7940, 7960 & 7970). Authenticate, Browse, Play, Rewind, e-mail, mark important. You can also assign calls to folders. Supervisor Access - Assign sets of phones to supervisors, using lists of phone numbers, or several types of patterns. Thin Client Deployment - The administration and user tools run in a web browser, be it Internet Explorer, Firefox or Opera. Integrated Support Tools - Request & receive technical support with a few clicks using the Remote Helpdesk support tool. Try Before You Buy - Download a fully-featured evaluation version with a friendly configuration wizard from http://www.shadow-technology.co.uk. Triangle Printers Inc. is proud to announce the addition of Molly Kuhn to its growing team of talented professionals. Kuhn, a graduate of the University of Wisconsin/Stout, brings with her more than 15 years of creative & production experience in her new role as Account Executive, including five years as a graphic designer and 10 years as a business development representative for some of the nation’s leading paper manufacturers and merchants. Her responsibilities at Triangle will include new business development as well as client relationship and project management. Kuhn resides in Glenview with her husband David and the couple’s golden retriever, Gus. She is an active member of the American Institute of Graphic Arts and Chicago Print Production Club, and her hobbies include watercolor and oil painting from her studio in Chicago’s Ravenswood neighborhood. Founded in 1955, Triangle is a full-service marketing communications company offering a wide range of strategic, creative and production solutions to clients both large and small. Services include design, photography, prepress, conventional & digital printing, fulfillment, mailing and more. For more information, or to set up a tour of the Triangle facility, contact Bonnie Dayan at (847) 675-3700, extension 262.